24+ Seeds. 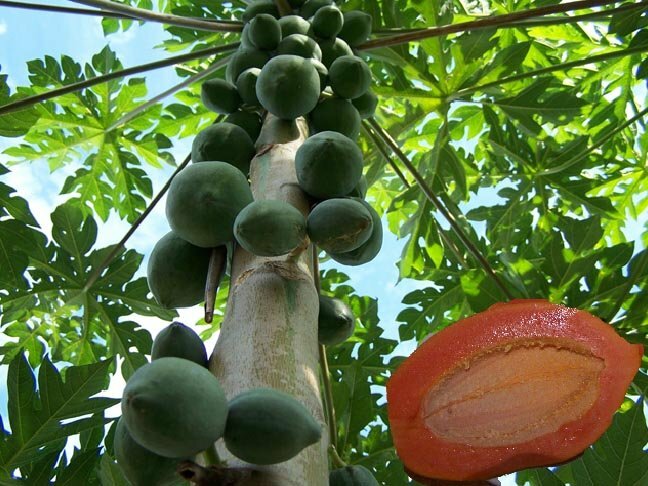 These papayas get the LARGE (12 long) fruits with flavorful red flesh! They make excellent plants to add a tropical feel to your patio, deck or pool area with their unusually shaped large leaves. 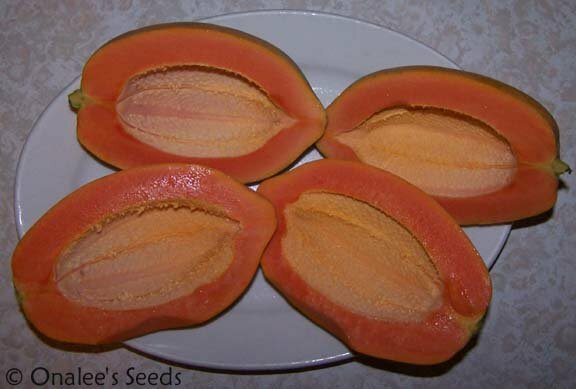 24+ Large Red Caribbean Papaya Seeds (Carica papaya) including planting instructions. These are from our home grown papaya's - 100% organically grown and germination tested. These papayas get the LARGE (12 long) fruits with flavorful red flesh. These are hardy to 32?F, but obtain optimal growth in warm (HOT!) zones. Grows best in full sun, in sandy, well draining soil. These can be container grown in colder areas and kept in a greenhouse over winter (start plants in late summer or early fall, over winter in greenhouse and set out in spring for fruit late that summer or early fall). They make excellent plants to add a tropical feel to your patio, deck or pool area with their unusually shaped large leaves. You will need a female *and* male tree, OR a hermaphrodite tree, to produce fruit. You won't be able to tell which trees are which until they bloom. Female blooms are conical and right on the trunk of the tree, while male blooms are held out on stalks away from the trunk, hermaphrodite blooms are on the trunk of the tree also, but the blooms are more cylindrical than female blooms. If you live in a zone where these are not hardy, then you should start your plants in late summer and overwinter them indoors in containers, setting them out the next spring after all danger of frost is past. This way, you can get fruit by the end of the summer after you set them out.